Studio 5380: Have A Blast! I hope your weekend is off to a great start and you have lots of crafty plans! If you need a bit of motivation or maybe a challenge to play along with you, boy...can I point you in the right direction! 1) Anything Goes! That's our challenge this week at the Peachy Keen Stamps Blog. You do need to use Peachy Keen Stamps for this challenge, but beyond that - anything goes! 2) Polka Dots AND Stripes! One of the 2 challenges going on this weekend over at The Peachy Keen Connection. 3) Monochromatic! That's challenge number 2 going on at The Peachy Keen Connection. The challenges at The Peachy Keen Connection will each have a drawing for a 25.00 Gift Certificate to the PK Store! You must use a Peachy Keen Stamp on your project to qualify and your project must be linked up by midnight on Sunday (Feb 10). So, that should be enough to keep you busy this weekend! * To create my moon shaped card base, I started with a moon SVG file from the Silhouette Online Store. Using the "Offset" feature, I created my cardbase from gray cardstock. 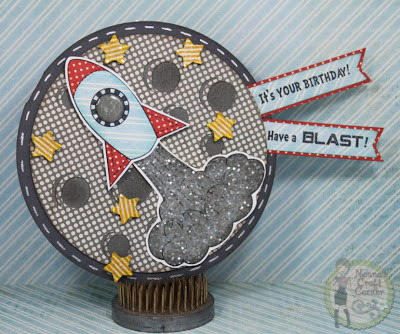 * The cute rocket ship and fun sentiment is from the Peachy Keen Stamp set Rocket Blast PK-167. I paper pieced my rocket and added Glossy Accents to the window. * The smoke from the rocket ship was covered with Glossy Accents, then I sprinkled on Martha Stewart's coarse glitter for some sparkle. * The cute little stars are from a punch and I added a bit of glitter to them also. Ok, now it's your turn! Go get creative and join one (or all 3) of our challenges this weekend! I look forward to seeing your creations! Also, be sure to check out the "outta this world" sale Kathy has going on right now at the Peachy Keen Store! Enjoy your weekend and I'll be seeing you soon! WOW this is fabulous. Love the design, papers used. Adding the glossy accents really makes it pop. So cute....love all the cute details! Have a super weekend! This is an adorable card! Love the rocket. WOWZERS.....another amazing card! 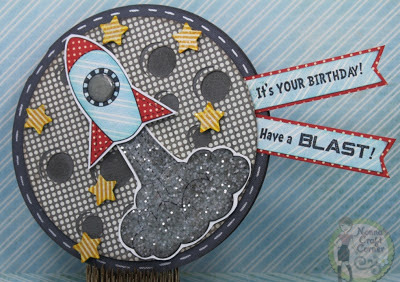 The rocket ship is so fun and love the darling sentiments hanging over the edges...so fun! This is just too cute, Tanya. You really make the most of this cute rocket ship. I love the whole card. This is so CUTE!!! Love the Rocket Ship. Tanya, you rocked this release! So FUN my friend! Love the stamp sets and you did ONE FANTASTIC job with all your projects! Great card, Tanya! The smoke looks super! What a clever idea! 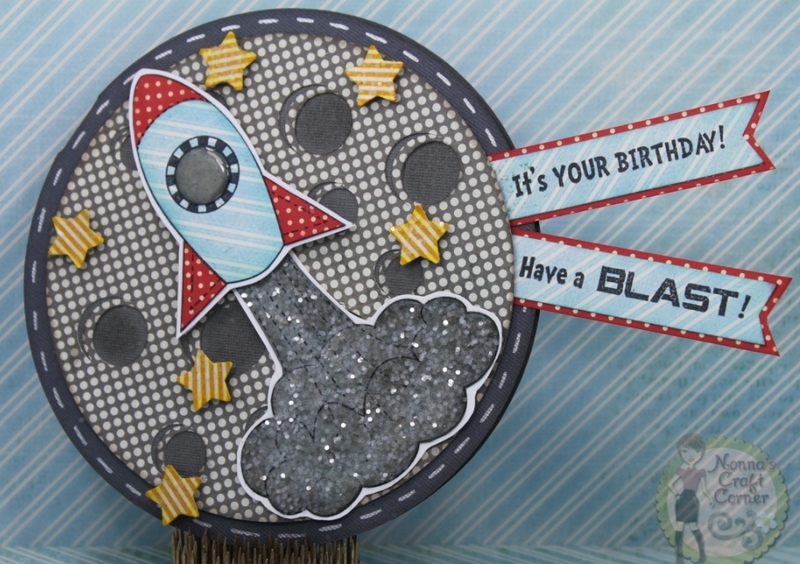 The papers are super and I love the touches of colour you've used for your space scene! Love, Love, Love !!! Bummed I didn't get time to join in the peachy keen connection challenges :( well there is always next time!! Just adore this card, I plan on doing a robot space theme for my peanuts room when he gets a little older. Tanya ~ Look at this FUN card! I LOVE the shape for it! So reminds me of a the moon! That image is so ADORABLE and I LOVE what you did with the smoke too! EEK! FABULOUS as always!